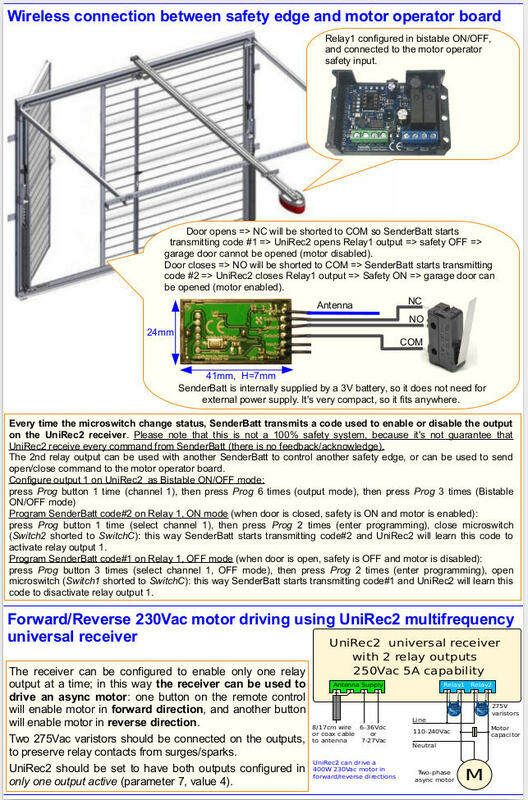 The following schema shows how to connect the receiver Creasol UniLock to activate one or two electric locks. 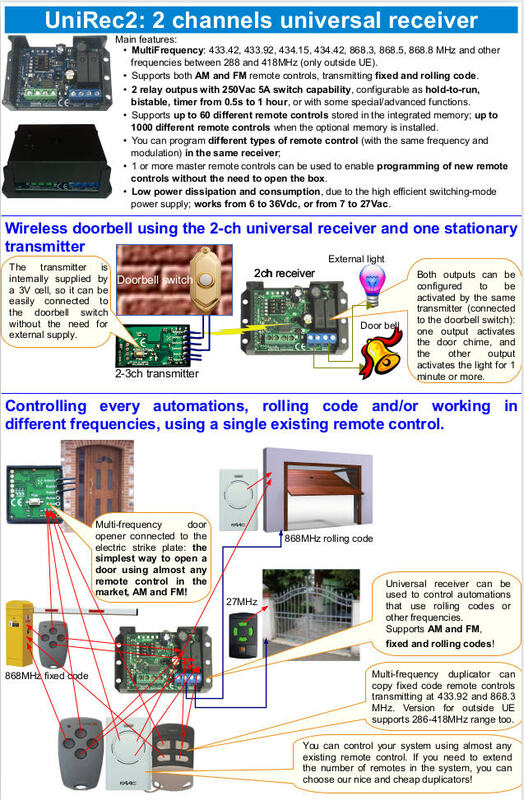 In this way it's possible to easily open any pedestrian gate and/or the entrance door using almost any remote control in the market, because creUniLock is compatible almost any remote control, fixed and rolling code, AM and FM, working in the frequencies 433.42, 433.92, 434.15, 434.42 MHz, 868.3, 868.5, 868.8 MHz, 288, 300, 303, 306, 310, 315, 318, 330, 390, 403.55, 418MHz. This cheap solution is also very simple to be integrated in the house, thanks to the easy connection and the very compact dimensions. Creasol UniLock has only 3 wires: 1 as antenna that must be left open, and 2 wires that should be connected in parallel with the existing switch. No need for additional power supply or battery! When a valid code is transmitted by the remote control, the two wires will be internally shorted by the Creasol UniLock, letting the current (max 3.2A) flows through the electric lock, activating it. Through the Prog button, the user can program the frequency, modulation (AM or FM), the number of activating pulses (1, 2, 3 or 4) and the pulse duration (100, 200, 400, 800ms).